Graflex, Inc. today announced plans to develop the world's first 4x5 Autofocus camera. Dubbed the Graflex Speed Focus Graphic, the camera will be produced in limited quantities. "With all the interest in Graflex and Graphics these days, we felt it was time to bring back one of the classics, and update it for the modern photographer," said Graflex public relations director April Dupre. Focusing will be the only operation automated on the camera. The autofocus mechanism is operated by a servo-motor attached to the focus bed rails. TTL focusing is accomplished through the new Grafocus back, coupled to the servo-motor. To focus the camera, the photographer inserts the Grafocus back, depresses the focus button, and waits while the motor racks the lens bed in and out to obtain perfect focus, indicated by the red LED. 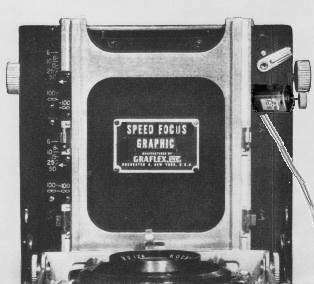 The Speed Focus Graphic will feature the same three viewfinders and rangefinder of the original Speed Graphic; all other operations of the camera will be unaffected by the autofocus. "We feel that the discriminating Graflex owner will prefer to keep these operations manual," said Dupre. Also, for low-light conditions, IR illumination is provided by #5R bulbs, in the accessory IR illumination attachment. There are no plans to offer automatic diaphragm or shutter speed settings. "Although, that may be an option if we bring out a 'Program Mode Exposure' for the Super D Graflex 4x5 SLR," said Dupre.